Upgrade your deck with the beautiful Veranda® decorative fascia, the perfect method for concealing the understructure of your deck. Veranda decorative fascia comes in 1/2" x 11-1/4" x 12' and is available in all decking colors. 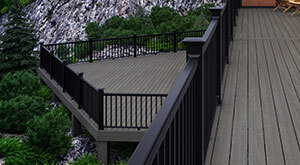 Designed to accent your Veranda composite decking and railing, the matching fascia colours ensure that you will not have to paint or stain the wood understructure. Amazingly versatile, fascia can even be used to wrap oversized posts; although it is not intended for structural use.